Fishing for kingfish can be a lot of fun! 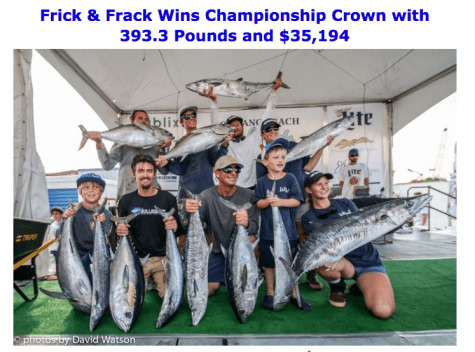 Smoker kingfish have inspired big tournaments like the SKA series and smaller meat fish tournaments in the South East United States. Kingfish are voracious eaters and can be targeted using lots of methods. In South Florida they can be seen skyrocketing out of the water to destroy kite baits, in Gulf States they are often targeted using slow trolled ribbonfish on down riggers, and just about everywhere they are willing to eat big blue runners and goggle eyes fished deep. Below #BullbusterAmbassador Double Threat Fishing Charters swings in smoker kingfish after smoker kingfish into the boat! Kingfish can are often found roaming the edge of deep reefs offshore most between 90' to 150' of water. They are definitely fun to catch on light tackle where they will make exciting and blistering runs. Heavy tackle however is often effective for catching tons of kings when fishing planners and spoons. Big kingfish like this one caught by #BullbusterAmbassador L&H Sportfishing will often miss your bait on their first pass. Be sure to use at LEAST a 2ft section of wire when fishing for them. We recommend using at least a 2 foot length of wire when targeting kingfish. You will definitely catch a good amount of kingfish on straight monofilament but if you are targeting kingfish directly you are going to want to go with wire leader. The way kingfish attack bait is by going in hot and at full speed to injure the baitfish with their sharp teeth. They often come in at full speed to chop off the back half of a baitfish and then turn around to get the second piece. Because of this style of hunting, kingfish will often miss your baitfish and cut you off. This makes it very important for you to back yourself up with the right amount of wire so that you have a chance at that second strike. When targeting kingfish we recommend using wire with a breaking strength between 30 and 60Lbs. Going any heavier can make the wire too bulky in the water and prevent your bait from swimming naturally and it will also prevent a finicky kingfish from committing to a strike! If you are looking for more strikes, we recommend using a fluorocarbon leaders to the lightest swivel you can. If you are comfortable tying an albright knot with your fluorocarbon, this can be a very effective method because it makes your leader less visible than your swivel. We thought we would break up the tips with an awesome video to get you pumped up! This video posted by #BullbusterAmbassador Team Swordacrazy is of them catching some big kings and wahoo during the 2014 SKA event! Remember we mentioned earlier that kingfish often times use the injure then eat technique. If you watch them underwater attacking baits they will often make big sweeping circles followed by intense beelines at your bait. Using a second hook or "stinger" hook can drastically improve your hook up ratio for big kings. A stinger involves a circle or j hook on the front end of your fish, and a trailing treble hook on the back end of it. When you are using a stinger rig, instead of just slicing your bait in half, a big king will get "stung" by your stinger! When situating your stinger rig, make sure that rig it in the way that it does not hamper the swimming action of your bait. A big kingfish has no problem eating a frisky bait on the surface of the water. Sometimes when the water gets a bit murky you need to send your baits down directly on top of a kingfish. When you are marking fish in the middle of the water column and you are between 90' and 150' of water, chances are they are big kings. Try sending a bait down with a down rigger, or weighting your line down with a rubber band attached to an egg sinker to get your bait down into the zone. Here is another video of #BullbusterAmbassador Team Swordacrazy kicking a** in kingfish tournament! When you are in the kingfish zone between 90' and 150' of water look for structure! Structure with passing current will tend to hold lots of bait and therefor big kings will be feeding in the area. Big kingfish and wahoo can be caught using the technique above. Above two anglers that attended #BullbusterAmbassador Angler Management's kingfish seminar are already catching more fish! When the kings are thick and you are out there looking to make a big batch of smoked kingfish dip. Pull out the planar rod. Using a planar and a small spoon can be an extremely effective tool to haul in the kings! When planing for kingfish its good to use big game reel (50-80Lb class) full with 65Lb -80Lb braid. Use a 25 ft - 50ft leader to wire and a trolling spoon. When you see your line go slack this means that the planar has lost its plane (this usually happens after a fish strikes), start reeling fast! Buy Bulk Braided Fishing Line - Get your planar rod set up to catch some big kings with our bulk braided lines. You are probably using a 50 wide or an 80 wide to planar fish for kingfish so you are going to need a bulk spool of braid. We recommend using 65Lb -80Lb braid for planar fishing. We have that in 1500 and 2500 yard spools. Cpt. Ryan from the Reward Fishing Fleet in Miami, Fl holds up a nice king caught by a happy customer on the old school ballyhoo king rig. Just because a fishing technique isn't new doesn't mean it does not work! One of the best kingfish rigs fished on head boats all over the South Eastern United States for kingfish is a 3 hook kingfish ballyhoo rig. This rig is essentially a knocker rig with 3 connected j-hooks. One of the reasons it is so effective, is that you actually don't need to use wire when fishing this setup since the three conjoined j-hooks act as your wire leader. When the kings are being really finicky pull out the fluorocarbon and make it happen with the classic kingfish ballyhoo rig. Butterfly jigging for kingfish is an exciting way to fish for them. Kingfish like baits that move fast, so when targeting them on jigs don't jig slowly, instead retrieve that jig like your life depends on getting it in. Kingfish will go crazy for something moving that fast and won't hesitate to attack it. When butterfly jigging at such high speeds try using titanium wire so that you do loose to many jigs and you do not kink your fish off. This is a nice kingfish that was caught on a Victory Lures vertical jig. People who like to jig usually fill their whole reels with braid. Braids thin diameter helps your jig reach the bottom with lightning speed. It also allows you feel subtle bites on your way down. We recommend using 40-50Lb braid when jigging in the kingfish zone, you never know when you might hook a wahoo. Kings are not shy to take down some big baits. Rigging up a BIG blue runner or a goggle eye is often the way to go when targeting smoker kingfish. Kingfish also love eating big ribbonfish. Trolling a big flashy ribbonfish will often get you the strike that you have been looking for. If you have been fishing a spot for 20 - 30 minutes to with little to know action, it may be the time to make a move. Kingfish often swim in big schools, so if you are not catching much you need to pick up and find another spot. Sometimes its not how your fishing, its the conditions you are fishing in. Make the run and find the fish. If the conditions are not right, #BullbusterAmbassador L&H Sportfishing always makes the move. Kingfish are a pelagic species, they are always moving around. Make sure that you know where the fish have been caught in the days leading to your trip. It is always good to have a good report, but sometimes it is better to assess the situation you see. If you are interesting in catching more and bigger kingfish, these articles may also interest you! How To Cook Your Kingfish - There are a ton of kingfish recipes in this article, our favorite is how to make a good smoked kingfish dip. Scroll Down In This Article To Learn How To Rig A Ribbonfish For Kingfishing - This article is an article on how to rig natural baits besides ballyhoo. What is relevant to catching more and bigger kingfish is the video on how to rig a ribbonfish for drifting or trolling. This article was part of a series of articles that we hope will help you spend more time fishing. To save time and money and ultimately spend more time fishing be sure to buy your fishing lines directly from our factory here at bullbuster.net. Fluoro’s density also makes it more abrasion resistant and therefore great for leader material. Some people claim that even if fluorocarbon was not virtually invisible they would still use it just for the abrasion resistance. If you're king misses the wire, you are going to want something that is going to have a fighting chance against those chompers! 5 Reasons To Buy Your Fishing Line In Bulk - This article talks about the advantages to buying you line in bulk, and why you will save both time, and money, and ultimately spend more time fishing when you buy your fishing line online. Buying bulk lines brand direct is definitely the way to go if you are a serious fisherman and are ready to go fishing at a moments notice. When you are traveling for kingfish tournaments like any tournament in the SKA series. You want to have your kingfish reels spooled with fresh line. On your way in you should be checking each kingfish reel to see if there are any knicks in the line. If there is a nick. Cut your line and re-spool. Being a champion is about attention to detail. 10 Reasons Why We Are The Best Fishing Line To Buy Online - If you're ultimate goal is to spend more time fishing. You should be buying your fishing lines online. Any serious kingfisherman knows that its about preparation. Buy your line online and get your team together to get everything spooled from home or on the boat. Buying your lines online will save you up to 50% because you are buying it directly from our factory. It will also save you time that you can spend kingfishing. Don't wait in traffic to go to the tackle store, to wait in line for what you need. Get this stuff delivered directly to your door so you can spend more time catching smoker kingfish. Buy Bulk Monofilament Fishing Line - If you are a serious king fisherman, don't buy quarter Lb spools. You know you are going to be fishing a lot of lines and you know that a lot of cut offs are possible with the razer sharp teeth of a kingfish. Buy your line in bulk. Be ready. Be prepared. Catch some monster kings. Use This Tool To Get Line Off Your Reel Fast - This link is to the page where you can find the Bullbuster Line Stripper. If you are fishing kingfish tournaments, this tool is your friend! The Bullbuster line stripper is an easy to use tool that when collected to your household drill can make taking line off of your reels up to 10 X faster. Our line stripper has been featured on Youtube as well as Marlin Magazine, and is a favorite tool of many fishermen to get their line off fast!